Moodle 2.0 has been out now since November 25th 2010, yes its been 6 months already, and so far there are 5 books out which focus on Moodle 2.0. So here is the list of books, and a short comment about each. Hope I didn’t miss any out. If there are others, please let me know and I will add to my list. 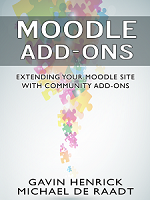 Whether you are a developer, teacher, administrator or project manager, if you wish to enhance your Moodle site with add-ons, this book will provide advice for evaluating add-ons and also help you to identify some great add-ons that will enrich specific aspects of your platform. The introduction is a great primer about the gradebook, providing a strong overview of what the key features are and how it can be used. It is short and to the point and leaves the reader ready to target the areas which are of most interest to them. This book shows you the quickest way to start using Moodle and e-learning, by bringing your existing lesson materials into Moodle. Demonstrates quick ways to improve your course, taking advantage of multimedia and collaboration. A straightforward coverage of installing and using the Moodle system, suitable for newcomers as well as existing Moodle users who want to get a few tips. A unique course-based approach focuses your attention on designing well-structured, interactive, and successful courses. Follow the creation of a history course that includes activities for all age groups, with subjects ranging from the medieval times up to the fall of the Third Reich. Make your students ‘ homework more exciting by enabling them to watch videos of historical documentaries, participate in group discussions, and complete quizzes from home. If you are faced with having to deploy Moodle 2 internally on a Microsoft platform without any external help, then this is a book that will certainly help you in the right direction. 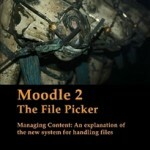 The release of Moodle 2 is the most significant upgrade to Moodle since its initial release in 2002. Much has been said about the new features, new architecture and new focus on Moodle being more â€˜pluggable with a multitude of other systems. Thanks for that Sue, any chance of a review copy? or has someone else done a review I can link to? Hi, Science Teaching with Moodle 2.0 was written by myself – Vincent Stocker not the person mentioned above. I’m glad you liked it, and found it useful. Thanks for that – fixed. Thanks for that, added, will add link a review once I find them too.